It’s not easy to cut a millefiori cane with accuracy and precision every time. Trust me, I know. 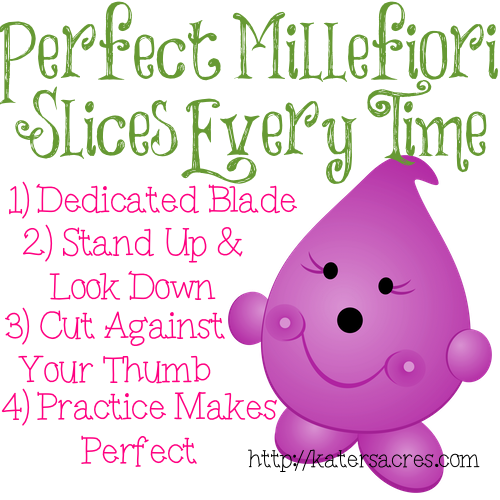 But there are a few things that you can do to make your millefiori cane cutting adventures a little easier. Over time my blades get duller. I replace them about once a year, but even a blade without a lot of wear can sometimes have a little knick in it that will cause your cane not to cut as precisely as you want it too. Problem solved: Use a dedicated clay blade specifically for cutting your millefiori canes. I have tried every type of polymer clay blade out there. The blade that I recommend is the Amaco PolyBlade. It is the thinnest blade and has the least amount of drag on your cane and slices cleanly. This might seem silly, but you can actually cut your blades more evenly by standing directly above you cane, looking down on it and slicing through. This allows you to slice at a natural perpendicular line to your surface. When you sit and slice, you will naturally have a tendency to cut at an angle. So what are you going to do? You are going to stand up, take a big stretch and slice your cane while standing. You will be pleased with your results. I have seen this demonstrated many times, so I am not sure where this idea originated. However, this works very well for pre-baked (cured) millefiori canes. For many of my Parker figurines, I use cured polymer clay millifiori canes to add the flower details. The easiest way to slice cured canes is to hold the cane against your thumb, place the exacto blade against the cane and slice slowly toward your thumb. Be very careful – you can cut yourself using this method. However, you can cut very thin slices of clay with your blade and use them for many different applications. 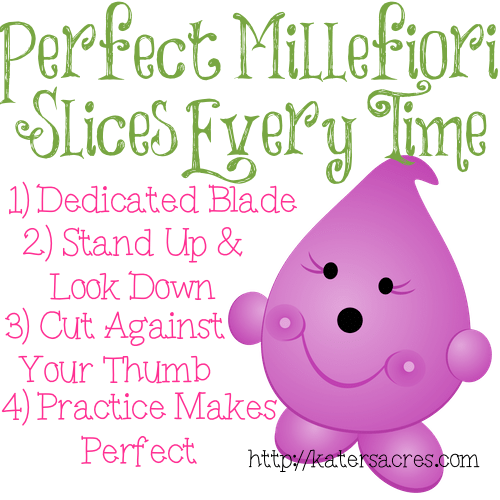 Keep trying to cut those canes and soon enough you will be slicing even, perfect, gorgeous slices straight from your millefiori cane. As always, if you’re not having fun while claying…then why do it? Thank you for these tips ! I’ll try them soon ! You mentioned cutting baked canes. How would you do that and what is the advantage to baking a cane? I will often reduce my canes VERY tiny (especially my signature cane). They are then SO SMALL that to cut them raw would be impossible, they would just smash. So, I bake them which maintains the cane and allows me to cut my cane and embed a pre-baked slice right into the piece I’m working on with zero distortion. Thanks for all the neat tips…I agree, I found that standing directly over the object to be sliced works way better! Happy 4TH of July! What kind of machine do you use to cut thick canes? How much does the machine cost? Where can I buy one? Hi Richard, I cut all my canes with a blade. I do not use a machine to cut the canes.